This month, Prime Minister Vladimir Putin told the Russian parliament that the country needs “to rise to the challenge” posed to global natural gas markets by the recent increase in production of shale gas in the US. Given how central the export of natural gas is to the Russian economy, one can understand why Vladimir Putin is concerned about what this new US gas boom might do to global gas prices. While US shale gas discoveries are obviously important for the overall North American supply of natural gas, the potential for Europe to have its own shale gas boom is perhaps of more immediate concern to Russia. 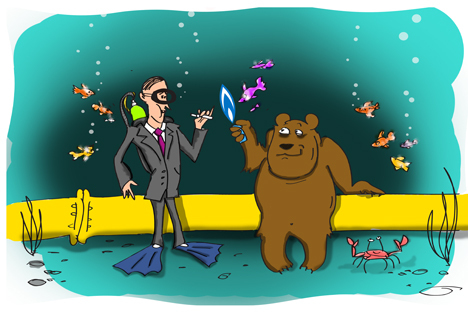 Around 70 percent of Russian gas exports go to the EU, and while the UK imports only around 2 percent of its gas from Russia, other big European countries, such as Poland and Germany, are major customers for Russian gas. Any large increase in the European gas supply would have serious implications for the Russian economy. According to the US Energy Information Administration, Europe has around 75 trillion cubic meters of shale gas, almost five times the previous estimate. That is equivalent to a reserve of 39 years, compared to the current 11-year conventional gas reserves. In early April, the British shale gas company IGas doubled its estimates of shale gas in north-west England to 130 million cubic metres, potentially making the UK’s reserves larger than those in Poland. However, removing this shale gas safely from the ground and distributing it to customers is far more complicated in Europe than it is in the US. European shale reserves generally present far greater geological challenges as its reservoirs are generally thinner than successfully commercialized shale gas sites in the US. A good shale gas reservoir has a shale thickness of between 90 and 180 meters – as is the case with the major US shale sites. But most European sites have far thinner reservoirs, with the UK’s standing at a mere 49 meters. Most European shale reservoirs are also deeper than those in the US, adding to drilling costs and complexity of extraction. European shale also faces a number of political, legal and regulatory hurdles that are far more pronounced than in the US and are likely to make the commercialization of shale gas significantly more challenging, despite the higher prevailing gas price. As the US experience shows, public health concerns over “fracking” can develop rapidly and prove a real barrier to access, as demonstrated by the ban on drilling in New York State. As Europe is typically far more densely populated than the US, these concerns could seriously delay drilling, as they have done in France, Sweden and Bulgaria. Recent experience of drilling European shale gas, notably in Poland, where prospects seem most promising, has been disappointing. That is not to say there will be no shale gas production in Europe, but the pace of growth is likely to be slow in relation to Europe’s rapidly growing need for new sources of gas. It will take to the end of the decade and probably well beyond before it is extracted successfully. Europe will continue to need Russian gas for the foreseeable future, and most likely in increasing quantities. Colin Smith is the head of energy research at VTB Capital.